You found the right website if you are searching for homes for sale in Las Vegas Retirement Communities. Our website has EVERY 55+ home for sale in NEVADA listed with the Greater Las Vegas Association of Realtors (GLVAR). An upscale, guard-gated age restricted community located in the South Summerlin master planned community. Siena enjoys easy access to the 215 beltway and is very close to the shopping and dining district, Downtown Summerlin. There are just over 2000 homes in Siena some of which are nestled around a Schmidt-Curley designed 18-hole championship golf course with waterfalls and lush landscaping. They range from 1166 sf townhomes to 3217 single story detached homes. The heart of the Siena social scene is the recently remodeled, 39,000 square foot Siena Community Center. Beautifully designed, the center has rooms for meetings, arts and crafts, computer labs, billiards and cards, an elegant library and the 7,200 square-foot Sunrise Ballroom where holiday and private events are held. The Siena Health and Fitness Center is 16,000 square feet and includes a state of the art fitness center, a full service day spa and salon, a wellness center, steam rooms, saunas, a four-lane 25 yard indoor heated pool and a heated out door pool and spa. There are four lighted tennis courts, pickle ball courts, bocce ball, and horseshoe pits. Siena is also home to Siena Golf Club and its 15,000 square-foot clubhouse that includes a full service golf shop as well as casual dining. The Siena Bistro boasts an outdoor dining patio that overlooks Lake Siena, the 18th hole of the golf course, and the driving range. The Siena Golf Club is a public course that offers discounts for Siena residents. Siena was built by Sun Colony who also built many of the homes at the nearby upscale Red Rock Country Club. There is a North section and a South section both with a guard gate. The clubhouse and golf club are located in the North section. Siena was built between 2000 and 2006. Popular nearby restaurants include Siena Authentic Trattoria (no relation to the community), Viva Mercados, Archie’s Thai Café. I love the elegant, spacious clubhouse and the amazing fitness center. This Del Webb 55+ community is located in the foothills of Black Mountain in Henderson, NV and contains approximately 7100 residences some with amazing mountain and city views. The community features three clubhouses, two 18-hole golf courses and over 50 clubs and interest groups. Del Webb’s Sun City Anthem in Henderson is home to one of the premier golf clubs in the Las Vegas area, The Revere Golf Club offering awe-inspiring views of the Las Vegas Valley and surrounding mountain ranges. The clubhouse has a restaurant Buckman’s Grille, pro shop and driving range. There are three clubhouses including Anthem Center featuring upscale furnishings, a Grand Ballroom, the Serenity Day Spa, a fitness center, and various hobby and craft rooms. The Independence Center contains a library, billiards and an additional fitness facility. The Liberty Center provides another indoor and outdoor pools, tennis, pickle ball and bocce ball courts. There are 12 tennis courts throughout the community. Sun City Anthem was built between 1998 and 2008. Popular nearby restaurants include Buckman’s Grill, I Love Sushi and Tuscany Grill. The incredible views and somewhat cooler temperatures. SCMR is one of the smaller Del Webb 55+ communities and is also located in the foothills of Black Mountain in Henderson, NV. 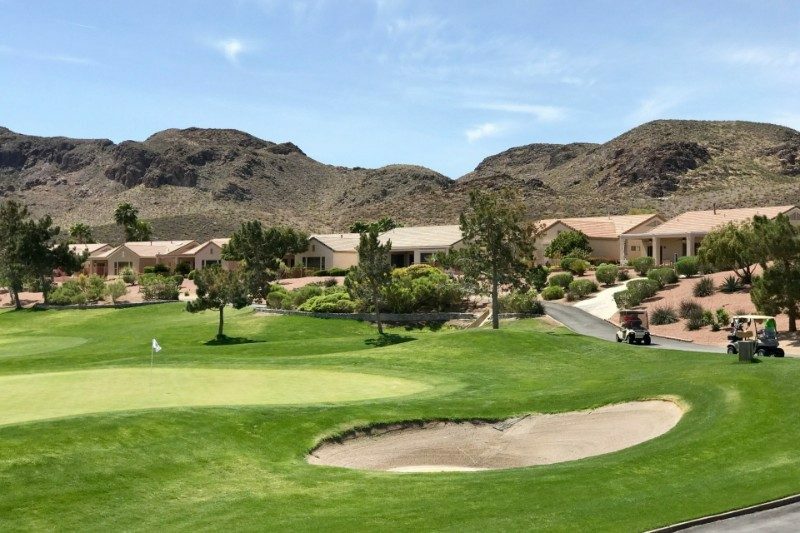 It has approximately 2500 homes and is centered around the public Desert Willow Golf Club which contains The Willows Restaurant, a pro shop, driving range and various chipping and putting areas. There is a community center with a ballroom, fitness center, outdoor pool and spa, three lighted tennis courts, pickle ball and bocce ball. SCMR has the lowest HOA fee of all the local Sun City communities. It is only 15 minutes from McCarren International Airport and five minutes from shops and restaurants of The District at Green Valley Ranch and the local casino and resort, Green Valley Ranch. This Del Webb community was built between 1996 and 2001. Popular nearby restaurants include Lucille’s Smokehouse BBQ, The Cheesecake Factory and Settebello Pizzeria Napoletana. The incredibly low HOA fee and its proximity to The District at Green Valley Ranch. This is the smallest Del Webb age-restricted golf course community at just over 2000 homes which are all single family detached homes. It is located in North Las Vegas at the base of the Sheep Mountain Range and is part of the Aliante master planned community which features the Aliante Golf Course and also has non-age restricted neighborhoods. It has easy access to the 215 beltway and is close to the Aliante Hotel and Casino. This Del Webb community was built between 2003 and 2008. Popular nearby restaurants include MRKT Seafood, Waffles Café, and Bistro 57. The flat open spaces that afford views of the Sheep Mountains and Mount Charleston. Sun City Summerlin is located in North Summerlin and is the largest 55+ community with over 7700 homes, four community centers, three 18-hole golf courses (Highland Falls, Palm Valley, Eagle Crest) on over 2400 acres. The hilly and sprawling terrain affords many beautiful views of the Las Vegas Valley and surrounding mountains. Sun City Summerlin also has the Starlight Theater featuring performances by many local entertainers, 12 lighted tennis courts, 10 pickle ball courts and even a softball diamond. Homes range from 1100 sf to over 3000 sf and many have golf course frontage or city and mountain views. This Del Webb community was built between 1988 and 1999. Popular nearby restaurants include My Mother’s House Italian, Nittaya’s Secret Kitchen Thai Restaurant and Ohlala French Bistro. The amazing amenities offered here and the Starlight Theater! This 55+ community is located in Henderson, NV just adjacent to the much larger Sun City Anthem. Solera has approximately 1822 homes, both attached townhomes and detached single family, that range from 1140 sf to 1771 sf. It has a 24,000 sf clubhouse with an indoor pool, fitness center, four tennis courts and an outdoor spa. Although it is not a golf course community, the Revere Golf Club is only a few minutes away. As it is also in the foothills of Black Mountain, the residents of Solera enjoy mountain and city views. This Del Webb community was built between 2003 and 2008. It’s proximity to the Revere Golf Course and the low HOA fee.